ARTnews recently profiled our partner for Marfa Dialogues/New York,the Rauschenberg Foundation, discussing its various philanthropic endeavors, notable programs, and the organization’s relationship to the life and goals of its founder: the late painter and activist, Robert Rauschenberg. continue reading over at ARTnews. To find out more about the Rauschenberg Foundation visit their website. The project, which is composed of a “curriculum” booklet and a mural, was a result of Tan’s collaboration with Professor Marion Wilson, who teaches a class about community engagement at Syracuse University. For Nature Matching System, Wilson’s students, inspired by Tan’s work, designed a curriculum and were then required to teach it to a 3rd grader at the local elementary school. Tan hopes to spread his “colorful and healthy effort” to other schools by allowing the booklet to be downloaded for free. an experimental game of chance operations and playful directives that will draw… (one) through the environment, its history, landmarks, flora and fauna, the iconic and the invisible. Please visit City As Living Laboratory’s website to learn more and to RSVP. In their new multi-media song cycle, singer and conceptual artist Nora York and co-composer Jamie Lawrence investigate the poetic and scientific weight of water — oceans, rivers, aquifers, lakes, streams, wells, and our bodies. Inspired by Handel’s Baroque orchestral Water Music Suites, Water Water Everywhere is both a love letter and a wake-up call about what is at stake in our current climate chaos. During their time at BRIC, York and Lawrence will collaborate with visual artist and cinematographer Carmen Osterlye on the visual elements of the performance. For additional information, visit BRIC and be sure to read the description of Water Water on the Public Theater’s MDNY participant page. The work-in-progress showing of the piece will be on February 28, at 7pm at the BRIC House Artist Studio in Brooklyn, NY. The gas and oil industry would like to craft a wholesome image of natural gas as a clean resource and a “nonfossil” fuel. Neither of these characterizations is accurate. Yes, gas does burn with a nice blue flame at the end user’s stove. However, getting that gas to the stove is seriously contaminating our air and water. This is because pumping it in means using high-volume, slick-water hydraulic fracturing, or fracking. Unbeknownst to many, the process has profound health and environmental impacts. Thanks to aged and faulty infrastructure, often built on the cheap and left unchecked for years, gas inevitably leaks on the way from wells to pipelines. Add up all the dangers along the way, and one will soon find that gas has a larger global climate impact than oil or coal. When we mention fracking to people in New York City, they often ask if we’re concerned about a place upstate, as though we are protected because it happens so far away. Nothing could be further from the truth. The numerous risks associated with fracking for New York City residents include contamination of drinking water from the Delaware Catskill Watershed and exposure to radon, a radioactive gas known to cause lung cancer, from gas used for cooking. Since November 1, 2013, the Spectra pipeline, built by the Texas-based company Spectra Energy, has started pumping a mix of Marcellus shale natural gas that has the highest levels of radon in the United States from Manhattan’s West Village to the East 14th Street Con Edison plant, and to New Yorkers’ homes. The Spectra pipeline is not the only recent danger New Yorkers face from the gas industry. The Rockaway Lateral pipeline, if approved, will run from underneath Brooklyn across Jamaica Bay and Rockaway Beach, threatening the ecosystem of Rockaway Bay. As we continue to develop natural gas, there will be more air pollution, contamination and impacts on food and the foodshed. With more drilling, there will be more waste and cuttings from drill sites, which trucks will be transporting to Long Island waste plants, likely resulting in spills and the contamination of Long Island Sound and the ocean beaches. Greater dependence on increasingly limited supplies of natural gas will also lead to much higher prices. The high levels of methane emissions unleashed by projects like the Spectra and Rockaway pipelines will contribute to accelerating climate change and attendant dangers like rising seas. In Manhattan we are standing in a cloud of methane from a leaky infrastructure, and the water around us is swelling. Be sure to continue reading at Creative Time Reports. Above image by Christy Rupp, Exploit/Exhale, 2010. Included in the Cooper Union exhibition “Emissions: Images from the Mixing Layer” as part of Marfa Dialogues/NY. This Clement World was written and composed by Cynthia Hopkins, directed by DJ Mendel, and designed by Jeff Sugg. It will run until February 2 at the Great Hall Black Box Theatre, in Toronto, Ontario. Please visit the Theatre Centre for additional information and buy tickets here. Be sure to also watch the teaser trailer on youtube. How do climate change and environmental issues relate to art? High Line Art set out to answer this question, investigating the intersection between art and the environment. High Line Art is the curated program of Friends of the High Line, which manages and oversees the High Line park. To explore artistic production and the environment, High Line Art curated a film series titled Solar that includes a selection of four videos by four individual artists: Rosa Barba, Camille Henrot, Basim Magdy and Neïl Beloufa. The videos featured in Solar, on view now at High Line Channel 14, spotlight the effect of humans on the environment through both realistic and futuristic narratives. With this film series, High Line Art emphasizes the importance of environmental activism in the arts. Over the past four weeks, we facilitated weekly “panels” between the curator, Cecilia Alemani, and the four artists in Solar. Using the hashtag #SolarPanel, these interviews occurred over Twitter every week in four installments, highlighting one artist per week. These tweets were only fragments of the full interviews, which we posted on our Tumblr the following day accompanied by an artist profile and a summary of the artist’s video. Through this program, the public gained an opportunity to learn more about the four artists whose films are featured on a more interactive platform. The artists’ fascinating answers offer a unique perspective into the artistic inspiration, process, and themes manifest in their work. Above photo by Timothy Schenck. Courtesy of Friends of the High Line. Rosa Barba, Somnium, 2011. Part of Solar, on High Line Channel 14. On view October 10 – December 4, 2013, on the High Line at West 14th Street. Tan, who was born in Malaysia and moved to New York in 2000, calls himself a “social sculpture artist” who collaborates with the public around ecology, food and urban agriculture issues. He has studied permaculture and composting, and since 2010, he has been raising egg-laying hens in his backyard. As Tan started plotting how to design food for climate emergencies, he spotted a surplus in the food system: ugly vegetables too misshapen or mottled for farmers to sell. He rescued the vegetables from a local market, and began to dehydrate them in a dehydrator and experiment with recipes. Then he vacuum-sealed them so they would last for up to a year. Visit The Salt to keep reading Barclay’s profile, and stick around for the DIY tips in the comments. On November 9, the Cape Farewell Foundation hosted an exciting panel and dialogue at the Rauschenberg Project Space between artists Mel Chin, Melanie Gilligan, Tom Ackers, David Buckland, Tom Rand, and environmental advocate, Hamilton Fish. Luckily if you missed out on the event, we do have these fantastic images from the night. Thanks to curator Amy Lipton from ecoartspace and photographer Aleta Wolfe for sending these along! The blog, “State of the Planet”, recently reviewed the Earth Institute and PostiveFeedback’s event, Art/Science Speed-Dating, where artists and scientists were brought together for quick conversations, and the hope of igniting “sparks” of inspiration for future collaborations. the crowd of approximately 25 artists and 25 scientists commenced speed-dating each other. After five minutes was up, it was time to switch seats to date another participant. Each dater met approximately a dozen counterparts. During the dates, participants shared with one another work they had done on cell phones and tablets, and exchanged information, making plans to talk in the future. Daters everywhere were rapt in conversation, and you could see an occasional wild hand gesturing in excitement. (Annea)Lockwood (a musician and composer) said she was struck by the generosity of the scientific community. “Several of the people I met in the round robin offered information about infra- and ultrasound sources for my current project, from caterpillars to bioluminescent animals, or said they would talk with colleagues — I can’t wait to track down the data and listen.” It is clear that the event set the stage for future conversations among the artists and scientists. At the end of the night, daters felt gratified and enlightened by the experience, but a little exhausted. “Twelve five-minute dates back to back is a lot of socializing, but everyone said that the experience was more than worth it,” (Eli) Kintisch (writer, Science Magazine) said. During the final talk back, many even wished that they had more time. Read more about the “fantastic” night at State of the Planet, and to learn more about the Earth Institute and PostiveFeedback check out their profile page. Studio Visit: C Spencer Yeh from Frieze on Vimeo. In keeping with Quiet Earth‘s ongoing examination of humanity’s place amid the changing volumes of planet Earth, Ballroom Marfa presents C. Spencer Yeh’s improvisations on violin, voice, and electronics. Yeh will be joined by Messages, the duo of Taketo Shimada & Tres Warren, for a performance at the Robert Rauschenberg Project Space on November 21, 2013 at 7pm. C. Spencer Yeh was born in Taipei, Taiwan and now lives in Brooklyn. Yeh’s work emerges initially from an improvisational practice, having developed a distinct musical vocabulary with violin, voice, and electronics. As a composer Yeh expands his approach, often employing video and other mediums to integrate visual and aural experience while investigating the role of the gesture. Yeh has performed and presented work in a variety of venues and situations internationally, including the New Museum, New York; the Contemporary Arts Center, Cincinnati; Issue Project Room, Brooklyn; Roulette, Brooklyn; ICA, Philadelphia; ICA, London; White Flag Projects, St. Louis; Performa; Lampo; Sónar; Frieze Music; and All Tomorrow’s Parties. He has collaborated with a variety of artists such as Nate Wooley, Okkyung Lee, Tony Conrad, and New Humans with Vito Acconci. Yeh is also a trailer editor and programmer at Spectacle Theater, Brooklyn. Messages is the New York duo of Taketo Shimada & Tres Warren. Mirage is the third full-length release by Messages, recorded in 2008 before their first two albums and has remained unreleased until now. This record documents the duo’s earliest long form drone explorations and intonations, most of which were recorded during long sessions in Tres’ basement bunker in the East Village. Mixing orbits of homemade acoustic instruments, electric drones & percussion, Mirage is a humid transmission sent straight from the womb. On Monday, November 4th, two of the leading voices on the issue of climate change — artist and honorary NRDC Trustee Maya Lin and NRDC President Frances Beinecke — discussed the critical role artists, advocates and scientists play in addressing climate change, the role of art in mobilizing and educating the public, and the great potential for environmentally focused artwork to affect climate change policy. The interactive discussion, part of the Marfa Dialogues / New York series, used Maya Lin’s most recent project, What is Missing?, as an example of collaborations to engage the public about climate change. Anne Pasternak, President and Artistic Director of Creative Time, moderated the discussion. Fairfax Dorn, of Texas contemporary art center Ballroom Marfa, founded Marfa Dialogues in 2010, hosting programming that explored issues related to the U.S.-Mexico border. A second edition on climate change followed in 2012. This year, the organizers hope to expand the program’s reach by extending its length to two months and by holding it in New York. Previous Marfa Dialogues have been held in the small Texas town (pop. 2,000) that gives the event its name. Marfa Dialogues/NY: Walking and Bicycle Tours (Saturday and Sunday) Several free events, pairing artists and scientists, will focus on how those in the art world can address problems associated with climate change. The programming is being offered by the Marfa Dialogues/NY, a collaboration of the Robert Rauschenberg Foundation; Ballroom Marfa, a Texas-based cultural center; the Public Concern Foundation, a nonprofit; and others. The promotion of bicycles as a mode of transportation in the Bronx is the focus of a bicycle ride down Broadway on Saturday, beginning at 10 a.m. at the East 180th Street stop on the No. 2 and 5 trains. Those who wish to participate need to provide their own equipment. On Sunday, several walking tours along Broadway will focus on different ecological issues in the city. At noon, the subject is the impact of trash and disposables, and a group will meet at Madison Square Park, at 23rd Street; at 1:45 p.m., a those looking at how the city handles storm runoff will meet at 173rd Street; and at 2:45 p.m., a group will meet at 168th Street effects of the environment on health. More information: marfadialogues.org. Artist Eve Mosher gave a talk as part of the Marfa Dialogues New York on October 30th, 2013, hosted by ecoartspace curator Amy Lipton at the Rauschenberg Project Space. The artist shared the story of her public art project HighWaterLine where she marked the ten-feet-above-sea-level line along nearly 70 miles of coastline, in lower Manhattan and Brooklyn, with a baseball line marker over the summer of 2007. Mosher recently collaborated with ecoartspace curator Patricia Watts to develop an HighWaterLine ACTION GUIDE so that communities anywhere can learn about her work and now mark their own line using Mosher’s project as inspiration. The guide was written for educators, nonprofit organizations and individuals, combining art and science to engage aesthetics while addressing environmental issues. In the guide, a range of waterline marking materials and other artists’ examples are provided, as well as Mosher’s step-by-step process involved in performing the project. This is the first in a series of ten guides that will be created by mid 2015 addressing a range of environmental issues. During her talk Mosher focused on the evolution of the project into the Action Guide and her upcoming HighWaterLine projects for Miami, Philadelphia and London. In these cities, community involvement and participation are crucial components in the planning stage, which is already underway. For these new projects she is working on a mapping website that will collect place-based stories, and collaborations with local artists. She elaborated about her collaborative process, the open source aspects of the project and the exponential impacts of giving the work away. Mosher also spoke about the performative part of the project and how initially she did not think of it being a performance. However, in the process of engaging with the public and in conversations with those she met in the streets while walking and marking the line, that it did indeed become a performance work of art. The talk at Rauschenberg Project Space took place one year and a day after Hurricane Sandy. Though Mosher doesn’t like the role of prophetess, her HighWaterLine did in fact anticipate the flooding and storm surges in some areas of New York that went well beyond her blue marked 100 year flood line – or what anyone thought was possible? Sometimes being a visionary artist is not all that easy and with people’s lives and well being at stake, Mosher’s upcoming HighWaterLine projects take on a new urgency. Well, even if Handel’s suites are not overtly about water, your project certainly is. How did you approach the issues of climate change and the politics surrounding water, which are only just now emerging as real concerns? I really knew nothing about this subject of water other than what we all know: that there are floods and droughts; that oceans are polluted; what we’ve all heard about fracking, and about warmer winters and colder winters. I needed to start with the how and what of water. I began my research on YouTube, watching tons of National Geographic documentaries about water and oceans and the hydrological system. I was interested in how water got here, which is amazing — Big Bang, planets, comets, volcanoes, endless rainstorms, that kind of stuff. There are also these documentaries online about the spiritual aspects of water, including about Emoto, this Japanese writer who claims water holds memory. I began my reading research with Elizabeth Kolbert’s “Field Notes From a Catastrophe.” She writes lots of investigative articles about climate: One that I found inspiring was about a scientist who helped solve the mystery of an ancient city’s rapid demise due to sudden drought. Sudden tipping points are really scary, and also musically interesting to me. I wrote a tune, “Tiny Blue Green Creature,” about how extinction is not only for Indonesian tigers and ancient Mesopotamian city-states. It’s about how similar our own situation could be to many civilizations now extinct. Later I dipped into Rachel Carson’s “The Sea Around Us,” which gave me the idea that our blood has the same chemical components as ocean water. Or just taste your tears. We just carry around a good deal of moving water. We have an internal ocean. I read “The View From Lazy Point,” by Carl Safina, founder of the Blue Ocean Institute. I met with him recently. We discussed how to “find people where they are situated” rather than to confront them with the looming disaster. This is really an issue — how to communicate the enormity of what is happening environmentally, and not alienate or disturb people so that they walk away. Garbage is another big issue in the oceans. None of the world’s major rivers still run to the sea all year round; there is just so much damming and routing of water for agriculture and cities. Keep reading here, and check out Nora York’s profile page for more info on her free performance at Joe’s Pub at the Public Theater. Be sure to attend the Cape Farewell Foundation’s recently announced event: “Climate is Culture” and the video installation, DEEP TIME, by artists Melanie Gilligan and Tom Ackers. For additional information please visit the Cape Farewell Foundation. I spend my days calling on lawmakers, community leaders, and concerned citizens to address the threat of climate change. Many of these conversations are fruitful, but there are times when field notes and policy blueprints fail to communicate the urgency of the climate crisis. Sometimes we need other ways to move and inspire people. Fortunately, we have a growing group of allies in this effort: visual artists. On November 4, I will be speaking with Maya Lin about the role artists, advocates, and scientists can play in confronting climate change. During the event, which is part of Marfa Dialogues New York, we will explore the power of art to mobilize the public and the great potential for environmentally focused artwork to affect climate policy. Maya has thought a great deal about the intersection of art and climate action. An NRDC trustee, she is a committed environmentalist who can talk policy details like a practiced wonk. But she is also an artist who brings a piercing intelligence and commanding aesthetic vision to her work. Since Maya designed the Vietnam Veteran’s Memorial as a Yale undergraduate, she has been known for creating work that commemorates the past. Her latest memorial is called What is Missing? and it offers a haunting depiction of the animals, plants, and landscapes that are disappearing as a result of climate change. The piece is organized around a central website, where people share their memories of cherished places and species they remember being more abundant in an earlier time. It also uses scientific data and historical records to flesh out a picture of biodiversity in a changing world. What is Missing? is a masterful combination of art, science, and advocacy. It conveys important information about climate change, but it also stirs deep feelings of loss and sadness, as well as awe at the beauty and resilience of our planet. It can speak to people who might never have called themselves environmentalists or who would never attend a climate rally, but are now moved to act on behalf of the places and animals Maya so vividly portrays. Keep reading on The Switchboard, and visit the NRDC page here on marfadialogues.org for details about tonight’s discussion. Climate and climate change-related data lend themselves to becoming creative material for artists who process and visualize these issues through specifically designed softwares. Climate is both the subject and the object of the «Climate Art: New Ways of Seeing Data» exhibition presented by the IMC Lab + Gallery, a New York City-based organization that has been supporting artists since 2001. Collaborating artists explore imaginative uses of technology and combine the tangibility of objects with the intangibility of virtual space. The choice of theme and the method of this exhibit reveal two very important aspects regarding the relationship between art, life and the technological world: the attention that art pays to climate change, its visualization through data collection and its organization in thematic mappings. Several artists have used the topic of climate as the subject for their work over the years, being that interest in this issue has increased exponentially with the ecological threat of global warming. Read the rest of the article here, and to learn more about IMC Lab + Gallery and the exhibition, visit their profile page. Tan greets guests for the opening of his latest work in a khaki shirt, cargo pants, and a flint striker on his belt loop. For someone who has spent much of the past two years training himself in disaster preparedness, Tan appears upbeat, and smiles warmly as he introduces guests to several large, military-grade cargo boxes of dehydrated food under a tarp. These are meals Tan’s prepared himself, first by sneaking food waste from an undisclosed grocery store, cooking the ingredients, drying the results, and packaging them to last. “MRE” stands for Meals Ready to Eat, and Tan stores them in medical cases he bought from Iraq war veterans on eBay. He started building his collection of MRE’s in 2012, but for the next two months he’s showing them as part of his New Earth collection, a series of projects meant to raise ecological consciousness. By combining food waste issues with disaster relief, Tan hopes that his MRE’s, which recently won a Core77 design award, will help educate the public on multiple aspects of food security. He plans on teaching MRE classes himself at the local Port Richmond high school…. Read the rest of the article here, and to learn more about Staten Island Arts and the exhibition, visit their profile page. In preparation for Superhero Clubhouse’s premiere tomorrow (in partnership with PostiveFeedback and the Earth Institute at Columbia University), be sure to read this post on the Earth Institute’s blog: State of the Planet. The ubiquity of art certainly means that it has great potential to influence, and the advantage that theater has over other art forms is that it can be a uniquely personal experience for the audience. Those in the audience are directly involved in the art because they have the opportunity to react to what they have seen. According to Pickard, “When you have an audience in the room, you can engage with them and can talk to them immediately. It is very direct.” And that is exactly what Pickard does. A question and answer session with the performers and scientists that help inform the work often follows Superhero Clubhouse’s performances and allows a discourse to begin right away. Nicole Davi, a postdoctoral researcher at Lamont-Doherty, agrees with Pickard that art and science are at an important crossroads, and she is a strong proponent for exploring the possibilities that this intersection has. Davi spoke about how scientists are trained to communicate to the world through written publications, which are for the most part very short. Davi explained that usually her goal is “to get as much information across with the least amount of words and with very little room for opinion or emotion.” This can make it challenging for the public to connect with scientists, but this play does a great job of doing just that. The production is a rare peek into how scientists collaborate and work together in the field, and lends a much more personal side to a largely impersonal area of study. Pickard believes that the only solution to climate change is through collaboration, and this story shows how that is possible. “Don’t Be Sad Flying Ace” and “Field Trip: A Climate Cabaret” will have performances on Nov. 2 and Nov. 3 at the Theater at the 14th Street Y (344 East 14th Street, between 1st and 2nd Aves). There will also be a special benefit performance with a reception and conversation with climate scientists at the evening performance on Nov. 2nd at 7pm. For additional information about Superhero Clubhouse and their MD/NY event, please visit their profile page and check out their flyer below. Tomorrow night October 30th at 7pm at the Rauschenberg Project Space, artist Eve Mosher will tell the story of her public art project titled HighWaterLine where she marked the ten feet above sea level line in lower Manhattan and Brooklyn with a baseball line marker over the summer of 2007. Little did she know when she conceived of this project that in 2012 Hurricane Sandy would pound the east coast with storm surges in some places beyond what anyone thought was possible. Mosher receives many requests to fly to cities around the world to duplicate this project. Since this would be an impossible task, she has recently collaborated with ecoartspace to develop an ACTION GUIDE so that communities anywhere can learn about her work and now mark their own line using Mosher’s HighWaterLine as inspiration. The guide was developed for educators, nonprofit organizations and individuals, combining art and science to engage aesthetics while addressing environmental issues. In the guide, other waterline marking materials and examples are provided, as well as Mosher’s step-by-step process involved in developing and performing the project. ecoartspace curator Amy Lipton will participate with Eve Mosher for this discussion. If you can’t join us in person please watch this 7 minute video with Eve discussing HighWaterLine. Or download the HWL Guide for free here. Thank you to Architectural Digest for reviewing Ballroom Marfa’s Quiet Earth for its AD Daily blog. The show is a study of quantities, in which pieces by renowned artists and architects reflect on the volume of our natural-resource consumption and, thus, our changing landscapes. To see their highlights from the show and read the full review, visit Architectural Digest. Be sure to check out these podcast episodes presented by Mary Miss/City as Living Laboratory in preparation for their event tomorrow. Finally, you should visit the Earth Institute at Columbia’s blog, “State of the Planet“, for posts by Mary Miss. E.A.T. board member Theodore Kheel had long been an advocate for public transportation, and as early as 1965 was proposing that subways be free in New York City. One of his affinities with Rauschenberg and Klüver was their shared belief in the power of art to communicate new societal ideas and the importance of artists speaking out on issues. He began a decades-long collaboration with E.A.T. and Rauschenberg to provide ways for the artist to “speak out” on local and global environmental issues. In 1970 Rauschenberg had created his first poster dealing with the environment. Inspired perhaps by the Vietnam War protestor teach-ins, Senator Gaylord Nelson from Wisconsin called for an environmental teach-in, which he called Earth Day, to be held on April 22, 1970. The response was huge, over 20 million people participated that year, and Earth Day is now an annual event celebrated by more than 500 million people and 175 national governments. Rauschenberg created the first Earth Day poster, published in an edition of 300 signed and 10,000 unsigned copies to support the American Environment Foundation. From an edition of 50 published by Gemini G.E.L. and The American Environment Foundation. Two years later, Kheel asked E.A.T. to coordinate a project in which Rauschenberg and seven more artists, including Jared Bark, Romare Bearden, Christo, Tom Gormley, Alan Sonfist, and Margery Strider, were asked to create prints commenting on the importance of public transportation versus the use of private cars and the unfettered growth of highways. The works were printed in the magazine LithOpinion, published by the Local One Amalgamated Lithographers of America union, to accompany articles by Kheel, Senator Edward Kennedy and writer Ben Kelley in a section called “Our National Transportation Mess.” Ben Kelly detailed the hold the “Highway Lobby” had on spending in the 1956 Federal Highway Trust Fund, which used some portion of the tax on gasoline to build highways throughout the country. Seen as necessary in the 1950s, by 1972 the program was so “successful” that, as Kheel noted in a 1992 “pledge for the environment” talk at the UN, “in less than two decades we had built enough highways to travel from here to the moon.” But along the way this highway system decimated the use of railroads, led to growth of suburbs that emptied cities of their middle classes, not to mention, “ traffic congestion, air pollution, ozone layer depletion, and the rapid deterioration of mass transit.” Senator Edward Kennedy outlined his attempt to pass legislation that use portions of the Highway Trust fund to fund mass transit initiatives, and Kheel wrote of his fight to have the Port Authority use funds for an effective transportation system in the New York City area. Coincidentally this work was made in 1972, the year of the UN Conference on the Human Environment in Stockholm June 1972, which was the first international gathering that paid attention to the global human impact on the environment, and attempted to forge a common approach to address the challenge of preserving and enhancing the human environment. He set about getting signatures for this Earth Pledge as a sign of support for the Earth Summit, with the idea that “the Pledge can give everyone in the world a chance to participate in the Conference, an opportunity to emphasize their concern about its success … the Pledge underscores that everyone is part of the problem and indispensable to the solution … it affirms the universality of the challenges we face… It also asks each one of us to do what we can in our daily lives to help, and there is much we can do. Rauschenberg had created a painting, Last Turn Your Turn, which incorporated the words of the pledge and again expressed up each individual’s responsibility for the future of the environment. The Robert Rauschenberg Foundation donated a limited edition of prints of the image to support the effort of the Earth Summit Pledge Committee. Kheel and Rauschenberg with New York City Bus in front of the UN at unveiling of Rauschenberg’s, Ozone, on the bus, 1992. Rauschenberg attended the Earth Summit in Rio, where Last Turn Your Turn, was shown at Riocentro and became an official image of the conference. … the Rio Declaration, which reaffirms and builds upon the Stockholm Declaration, has nevertheless proved to be a major environmental legal landmark. In resolution 47/190 of 22 December 1992 the General Assembly endorsed the Rio Declaration and urged that necessary action be taken to provide effective follow-up. Since then, the Declaration, whose application at national, regional and international levels has been the subject of a specific, detailed review at the General Assembly’s special session on Rio+5 in 1997, has served as a basic normative framework at subsequent global environmental gatherings, namely the World Summit on Sustainable Development in Johannesburg in 2002 and “Rio+20”, the United Nations Conference on Sustainable Development in 2012. Societies today depend on hydrocarbons—mostly coal, oil, and gas, which are becoming harder and more costly to extract. Energy companies want to extract all that can be found, whether from the Arctic, or tar sands, or deep offshore, or shale. They want to do this regardless of the fact that using fossil reserves causes global warming. But there are also renewable hydrocarbons, from living sources. Off the coast of Somalia sits an island called Socotra, populated by 40,000 people and strange, beautiful plants and animals that exist nowhere else on earth. A territory of Yemen, Socotra was once the location of a Russian naval base, and now a US air base. In recent years, Socotra has become dangerous to approach by sea due to pirates. My proposal is to make Socotra into a model of ecological development—beyond petroleum, beyond nuclear, beyond industrial farms, and full of healthy savage beasts. In Socotra, biological fuel, and then hydrocarbons, could be generated using the renewable resource of marine algae. Socotra receives a constant stream of cold, nutrient-rich water from Antarctic upwellings. Additionally, the island is near the equator, and so the sun shines brightly almost every day. This combination yields unending bioproductivity. Fish thrive. Shellfish, on rocks and in pools, thrive. Birds thrive. So does seaweed—a variety of bladder kelp that normally can be found only in the polar and temperate waters of the Southern Hemisphere. The algae’s bladders float near the surface of the water; due to the sunshine, the bladders build tissue, and thus produce carbon, doing so at a faster rate than any other plant on earth. I first recognized the potential of Socotra in 2010, while explaining an Antarctica-centered map of the world to someone in a newsroom in New Zealand. Given Socotra’s position on the globe, I could tell that its environment was ideal, and that its remoteness would enable its entire energy economy to become local, including its auto-fuel market. This island can change the game. with ecological scientists, in order to build a hydrocarbon economy based not on petroleum but on biofuel—and not on any biofuel, but on biomethane. We could be the first to establish a methane economy. Moreover, Socotra could become the world’s first biology economy. The methane would come from seaweed and other biomass, not from fossil reserves. Because it has very few roads, very few inhabitants, very few cities (or villages), and a very rich biological base, Socotra could achieve market saturation, which is necessary for a successful conversion from fossil fuel to biofuel. One hundred percent of the vehicles, homes, and even aircraft could run on methane. I founded Ocean Earth in 1980. Coleen Fitzgibbon joined me, and soon after so did Eve Vaterlaus, Wolfgang Staehle, Paul Sharits, Taro Suzuki, Bill Dolson, Joan Waltemath, and Jonathan Crary. Sharits, Fitzgibbon, and I decided to begin with satellite monitoring of global hot spots. We considered satellite observation a form of civil defense, or “Space Force,” a “well-regulated militia” alerting the public to dangers. In the next decade, major contributions came from Dolson, Staehle, and two newcomers, Ingo Guenther and Sante Scardillo. We began working primarily in Europe, where the firm could act on its New York corporate charter to produce and sell “media services“ (such as satellite imaging for mass media) and “architectural components” (such as earthworks, megastructures, and lightweight-architecture elements for eco-efficient cities). Following many battles with government authorities, the company was re-formed in 1994 as Ocean Earth Development Corporation. In 2008, it was turned into a firm consisting of five director-stakeholders: myself, artist Eve Vaterlaus, and architects Kevin Gannon, Heidi Mardon, and Catherine Griffiths. Along with Bernie Dent, I am also the principal stakeholder in a subsidiary organization, Ocean Earth NZ Limited. The offshore techniques described in this proposal were developed by Griffiths, Vaterlaus, and Mardon, who in 1994 secured a site in New Zealand where we could implement our work with bladder kelp, which was the reason for Ocean Earth’s incorporation in that country. When I was invited to exhibit in New Zealand in 2008, I turned the occasion into a three-year collaboration with Mardon and others. We acquired substantial hands-on experience in growing and harvesting algae. The goals of Ocean Earth are a revival of those defined by Leon Battista Alberti in his Ten Books on Architecture (1452). (1) Clean air: hence, biomethane as the main fuel. (2) Living waters: hence, structures to restore rivers and streams. (3) Circulatory space: hence, buildings, pipes, and roads that interfere little with the native animals and plants, while allowing access. (4) Defense: hence, gathering knowledge of incoming threats through the use of satellites. We discovered Alberti more than one decade after Ocean Earth was formed, but all along, the company was addressing all four goals of architecture as Alberti defined them—what architects are supposed to do, but generally don’t at all. And these goals can now be pursued on the island of Socotra. you can read the full essay here, and learn more about Triple Canopy on their MD/NY profile page. “Gap Ecology (Three Still Lives with Cherry Pickers and Palms),” Socrates Sculpture Park’s current installation by artist David Brooks, is composed of three 60-foot boom lifts filled with plants…. The artist’s extraordinary gesture was inspired by the light gaps—exposed areas formed by falling trees that allow new species to grow—of the Amazon rainforest. At first glace, it may be difficult to relate “Gap Ecology” to this phenomenon. But the presence of Manhattan’s skyline looming in the background almost slows down time and points out things you’ve never seen before. With all this in place, it’s easier to begin to understand Brooks’ work: These lights gaps resemble the electric-light gaps of New York City—“from dormant construction sites, to the formation of urban parkland, or natural disasters such as Sandy,” he explains. In fact, Brooks relocates the installation to a different spot in the park each week. While this move may seem purely cinematic, he claims it highlights how important structural flexibly is to urban environments. Brooks excels at showcasing the relationship between the individual and the built and natural environment. On October 12, The IMC Lab + Gallery held an opening reception for “Climate Art: New Ways of Seeing Data.” The exhibition is curated by Isabel Walcott Draves, and features the work of established software artists Ursula Endlicher, Ben Fry, Aaron Koblin, Nathalie Miebach, Camille Seaman, and Karolina Sobecka. These artists seek to measure the immeasurable, using data to create visual representations of the impact of climate change on the Earth and its inhabitants. For additional information about MD/NY and the IMC Lab + Gallery, please visit their profile page. After Hurricane Sandy swept through the region, people wandered the Rockaways like zombies, cloaked in blankets to protect against the mid-autumn chill. Families were left traumatized by homes reduced to skeletons. For weeks, the elderly and disabled, trapped in their apartments on high floors, waited for food and heat. A year later, Gilles Peress, a photographer for the photo agency Magnum, is releasing a book that documents the devastation of “the powerful storm with the innocuous, neighborly name,” in the words of the book’s editor, Hamilton Fish. The difference between this book — titled “The Rockaways” — and many other photographic compilations of the disaster? Keep reading in the New York Times, and join us tonight from 6-8pm (October 18, 2013) for The Rockaways Launch Party at The powerHouse Arena, 37 Main Street (Dumbo) in Brooklyn, NY. More info on the Concord Free Press profile page. Here are some images from the wonderful WATERWASH ABC event with Reverend Billy and the Earthalujah Choir on October 5. A big thank you to Lillian Ball for sending us these photos. For more information on the event, check out WATERWASH’s profile page. You don’t have to be a scientist, engineer or policy maker to weigh in on the impact of climate change. Right now, all around New York City, visual artists, architects and performers are tackling the subject as part of Marfa Dialogues/New York, a two-month series of environmentally engaged public events. The ambitious festival is organized by Ballroom Marfa, a tiny gallery in the tiny West Texas hamlet of Marfa (population 1,899, according to last year’s census). But the desert town’s cultural footprint has long belied its size. In 1971, the Minimalist artist Donald Judd arrived there from Manhattan, and subsequently transformed a decommissioned Army base into the Chinati Foundation, an indoor/outdoor museum that is a favorite pilgrimage of the art cognoscenti. More recently, a wave of artists has moved there. “There Will Be Blood” and “No Country for Old Men” were both filmed there, and in 2008, the town got its own film festival. Founded in 2003 in a former dance hall, Ballroom Marfa serves as a younger counterpart to the Judd compound. Its year-round programming balances the emerging with the established (Takashi Murakami balloons, screenings with John Waters, a Bon Iver concert), helping place Marfa within the broader cultural consciousness. This year’s New York migration offers proof of Ballroom’s expanding sphere of influence. For those of you lucky enough to be in London for Frieze this weekend, make sure to stop by Altman Siegel‘s booth to see artist Trevor Paglen’s new work: Prototype for a Nonfunctional Satellite. Paglen, whose work is currently part of Ballroom’s Quiet Earth exhibition in New York, is one of the most cerebral contemporary artists, examining topics as varied as geography, the United States military, and space travel. Paglen transforms what would usually be viewed as a scientific object, into a work of art; consciously putting “aerospace engineering into conversation with the legacy of minimalist sculpture, earthworks, and formalism in general.” And like most works of art, it really should be experienced in person (but a .gif is good too). The Carbon Tax Center presents Panel: How Will A Carbon Tax Change Our Lives? On November 1st, four distinguished and provocative thinker-scholar-activists —Denis Hayes, Elizabeth Yeampierre, Juliet Schor and Tim DeChristopher –will discuss ways in which a U.S. carbon tax could transform Americans’ beliefs and practices regarding consumption, energy use and the natural world, and also re-connect the environmental movement to wild nature, community and diversity. Doors open at 6:00pm, light refreshments will be served. The panel begins promptly at 6:30pm at the Rauschenberg Project Space (455 W. 19th st, New York, NY). When considering a sculptural intervention to take place in NYC, that would act both as a symbolic gesture as well as a discursive device furthering a conversation around climate change, I naturally thought of the Amazon! In the Amazonian forest, the onslaught of rainy season storms often results in the natural felling of old growth trees. When one of these towering hardwood giants topples, it can take a handful of neighboring trees with it, thus ripping a hole in the forest canopy and forming a “light gap.” This newly formed gap in the forest is quickly colonized by opportunistic species in the undergrowth — palms, bamboos and various shrubby plants that capitalize on such improvisational events. Taking advantage of their brief exposure to light, these pioneering species begin fruiting and flowering at accelerated speeds, attracting numerous bands of animal life to their momentary bursts of growth — a veritable bacchanalia. These species are not designed for long-term existence in the rainforest, but are designed to take advantage of a rupture in the status quo. My installation at Socrates Sculpture Park makes an analogy between this phenomenon common in rainforest ecology with that of New York City’s urban fabric. With this installation, Gap Ecology (Three Still Lives with Cherry Pickers and Palms), one may recall the numerous “light gaps” that dot the city — from dormant construction sites, the formation of urban parkland, or natural devastations such as Sandy. Here in New York City, the priorities within our daily lives indirectly dictate the shape of our infrastructures, which in turn dictate the shape of the landscape around us, which affects the health of the larger biosphere, which comes back around to affect our daily priorities. Gap Ecology is conceived as a symbolic gesture that bridges the perceptual gaps between these micro to macro spheres. It is a roving installation, meaning I relocate it to a different place in the park each week, and its constant movement signifies the ever-changing landscape and need for structural flexibility within our urban environment. Gap Ecology consists of three “cherry pickers”, or aerial boom lifts — common pieces of heavy machinery that tend to live on job sites throughout the duration of large construction projects. Paralleling the rainforest cycle, the passenger baskets of each boom lift are filled to the brim with palm trees — enacting their own bacchanalia above the park. Cherry pickers are not infrastructure per se, but they are the hands that touch infrastructure. Placed at Socrates, in an urban landscape that has undergone a visible infrastructural development, as well as a building dormancy, and adaptations that account for development’s affect on a neighborhood, Gap Ecology acts as a beacon to passersby of the ongoing change and evolution in their built and natural environment. GhostFood brings Marfa Dialogues to Newark. Parked on the block where Gallery Aferro, with the support of the Newark Arts Council, curated several shows with local Newark artists, the GhostFood truck served art patrons and the general public over 3 days (October 11-13). The GhostFood truck debuted in Philly earlier in the week. Next week on Tuesday October 15th from 6-8pm, Ballroom Marfa opens Quiet Earth at the RRF Project Space at 455 West 19th St.
Gallery Aferro’s GhostFood will be parked outside the opening. Carbon Tax Center– Will A Carbon Tax Change My Life? Miriam Simun presents at the 2013 Creative Capital Artist Retreat from Creative Capital on Vimeo. Check out the GhostFood schedule on our Gallery Aferro page. Beginning October 22, the Cooper Union School of Art and the Institute for Sustainable Design present EMISSIONS: Images from the Mixing Layer, featuring work by Coleen Fitzgibbon, Ruth Hardinger, Joe Lewis, Christy Rupp, and Rebecca Smith. Joe Lewis, a nationally known artist, arts administrator, educator and author is dean of The Clarie Trevor School of the Arts,University of California, Irvine. He has also served as deal fo the school of Art and Design at Alfred University, NY and the faculty of California Institite of the Arts (Calarts) while also administrating a public art program for the City of Los Angeles. Lewis is the recipient of numerous awards including several National Endowment for the Arts grants, a Ford Foundation Fellowship and a Thomas J. Watson Fellowship. Most recently, he was named Deutsche Bank Fellow in Photography by the New York Foundation for the Arts. Lewis has written for Art in America, Artforum, and was a contributing editor for Artspace and a correspondent for Contemporanea. His essay regarding the confluence of art, technology and society have been published in anthologies and peer reviewed journals. Christy Rupp, is an American eco-artist, born in Rochester NY, too young for Elvis, and too old for Barbie. Currently living & working in NYC and Saugerties. There will be an opening reception on October 22 from 6-8pm and the exhibition will be on view until November 8 in the Great Hall Gallery at the Cooper Union (7 E. &th Street). Read more about EMISSIONS and the Cooper Union Institute for Sustainable Design at their profile page. There is an imminent and critical need for diverse communities, particularly communities of color, to acquire the capacity to plan and develop their neighborhoods in response to climate change and attendant disasters. In recognition of that need, the Center for Social Inclusion, in collaboration with the Pratt Institute Programs for Sustainable Planning & Development, will present a series of town hall community conversations at cultural institutions located in New York City neighborhoods most impacted by Hurricane Sandy – the Lower East Side, Brooklyn and the Rockaways. With presentations from architects, planners, artists, environmental activists and community leaders, the conversations will focus on recovery, adaptation, mitigation and planning in communities that are most vulnerable to the effects of climate change. Snapshot from the Quiet Earth installation in New York City, featuring two of our former interns working on a Maya Lin piece. The Rockaways—published on the first anniversary of Hurricane Sandy by the Concord Free Press—combines visceral photos by renowned photographer Gilles Peress (Telex Iran, Farewell to Bosnia) with the voices of residents of The Rockaways, one of the communities hit hardest by the superstorm. The CFP will distribute 3,000 copies of The Rockaways via independent bookstores, museums, and internet requests—for free—asking only that recipients donate to a Sandy-related aid organization, another charity, or someone in need. Then pass the book on to another reader so that he or she can give. This generosity-inspiring book is a collaboration between the CFP, Kodak, Peress, and dozens editors, writers, and printers—all donating their time and talent. Read more about The Rockaways and Concord Free press at their profile page. The forecast is extreme: The 2000s were the warmest decade in our recorded history. In 2010, a Christmas blizzard buried our streets beneath more than 20 inches of snow. One year ago, Hurricane Sandy devastated our city with wind and rain. WNYC, in collaboration with Marfa Dialogues/New York, will bring four of our country’s top experts on environmental science and policy for an historic panel discussion on the urgent and confounding questions raised by accelerating climate change. Brian Lehrer, host of WNYC’s eponymous Peabody Award-winning morning show, welcomes physicist and visionary environmental scientist Amory Lovins; Chief of Energy Finance and Planning for New York State Richard Kauffman; Margot Anderson, Executive Director of the Energy Project for the BiPartisan Policy Center and a long-time US senior energy policy maker; and Guy Nordenson, the Princeton structural engineer and professor of architecture appointed by Mayor Bloomberg to the New York City Panel on Climate Change. They’ll explore the politics of climate change and explain the latest strategies to limit environmental damage, as well as the promising initiatives already underway nationally and here in the tri-state region. Physicist Amory Lovins is cofounder, Chief Scientist, and Chairman Emeritus of Rocky Mountain Institute; advisor to major firms and governments worldwide on advanced energy efficiency; author of 31 books and over 490 papers; and recipient of many honors, including the Blue Planet, Volvo, and Mitchell Prizes and MacArthur and Ashoka Fellowships. He is an advisor to the Chief of Naval Operations and a member of the National Petroleum Council. In 2009, Time named him one of the world’s 100 most influential people, and Foreign Policy, one of the 100 top global thinkers. Margot Anderson is the executive director of the Energy Project at the Bipartisan Policy Center (BPC). She was a senior advisor to the deputy secretary of energy and from 2004 to 2009 an office director at the Department of Energy’s Energy Information Administration (EIA), where she was responsible for EIA’s short-term energy forecasts, U.S. energy consumption surveys, and the international statistics program. From 2000 to 2004, Anderson was deputy assistant secretary for Policy Analysis, Department of Energy, where she worked on a wide range of energy and environmental policy issues. From 1998-2000, Anderson directed USDA’s Global Change Program focusing on the economics of climate change on agriculture and forestry and on international climate negotiations. Anderson holds a B.A. in economics (University of Cincinnati) and an M.S. and Ph.D. in agricultural economics (University of Illinois). Richard Kauffman has been Chairman of Energy and Finance for New York State since February 2013 and was recently confirmed as Chairman of the New York State Energy Research and Development Authority (NYSERDA). His mission is to develop and implement a strategic plan to scale up clean energy, enhance New York’s competitiveness for clean energy businesses, and make our energy systems more resilient and reliable. Mr. Kauffman has served as Senior Advisor to Secretary Steven Chu at the U.S. Department of Energy. He has worked in energy and finance at some of the highest levels of both the public and private sector. Among his positions in his private sector career, he was Chief Executive Officer of Good Energies, Inc., a leading investor in renewable energy and energy efficiency technologies. Mr. Kauffman has served on the boards of several organizations, including the Brookings Institution and the Wildlife Conservation Society. Mr. Kauffman earned a bachelor’s degree from Stanford University, a master’s degree in international relations from Yale University and a master’s in public and private management from the Yale School of Management. He is a member of the Council on Foreign Relations. Guy Nordenson is a structural engineer and professor of architecture and structural engineering at Princeton University. He is co-founder of the Structural Engineers Association of New York and co-curator of the “Tall Buildings” exhibition held at MoMA QNS in 2004. He is also Commissioner and Secretary of the New York City Public Design Commission. Nordenson is the recipient of the 2007 AIA College of Fellows Latrobe Research Prize and author of Seven Structural Engineers – The Felix Candela Lectures in Structural Engineering (2008 MoMA) andPatterns and Structure (2010 Lars Müller Publishers). He was a recipient of the AIA’s 2009 Institute Honors for Collaborative Achievement Award and is a fellow of the American Academy of Arts and Sciences. He is also active in earthquake engineering, including code development, technology transfer, long-range planning for FEMA and the USGS, and research. He initiated and led the development of the New York City Seismic Code from 1984 to its enactment into law in 1995. He has been engaged in climate adaptation research and its implementation for New York City as a member of numerous committees and task forces, including the NYS 2100 Commission appointed by Governor Cuomo. New York, New York – September 23rd 2013 – The IMC Lab + Gallery is pleased to present “Climate Art: New Ways of Seeing Data”, a show on the perspectives of data, climate, and art curated by Isabel Walcott Draves, Founder of LISA (Leaders in Software and Art). This data visualization exhibit is part of the Marfa Dialogues/NY, a citywide examination of climate change science, environmental activism and artistic practice happening this October and November in New York City. Marfa Dialogues/NY features more than 20 Program Partners, including the IMC Lab + Gallery, and a spectrum of exhibitions, performance, and interdisciplinary discussions at the intersection of the arts and climate change. Can the things we once thought of as infinite be quantified? If they are not infinite, when will they end? This collection of works brings together a selection of pieces by established software artists Ursula Endlicher, Ben Fry, Aaron Koblin, Nathalie Miebach, Camille Seaman, and Karolina Sobecka, which attempt to measure the immeasurable: the directed gaze, existence, the sky, power. Looked at through the lens of climate change, these works make us think about our interaction with the natural world, and whether something that used to seem impassive, impenetrable, and immovable — the globe, the bedrock we stand on, this Earth — is in fact as fragile as a cloud. If taking the measure of something means forming an opinion about it, the data driving these pieces make us think more carefully about the logistics of our environment. The exhibit invites the viewer to notice our ecosystem and consider our impact upon it as a real and quantifiable force. The exhibit opens October 12, 7-9 PM at the IMC Lab + Gallery and will remain on view through November 27. Tattfoo Tan checks in with an image from his New Earth MRE installation at Staten Island Arts. Follow @tattfoo for updates on this project, expired food restaurants, egg counts and the advantages of an insect-based diet. This special issue of The Washington Spectator coincides with the launch of the Marfa Dialogues/New York project—a citywide public conversation on climate change scheduled for this October and November in New York. More than 30 organizations—leading cultural and academic institutions, arts initiatives and advocacy groups—will present a spectrum of programs that engage climate-related issues over the project’s two-month calendar. The animating idea behind Marfa Dialogues is to bring artists and people from the creative community together with journalists, academics, scientists, public interest advocates and activists to explore social and political themes. The Public Concern Foundation, the publisher of this bulletin, co-founded this project together with Ballroom Marfa, a leading contemporary arts center in Marfa, Texas, in 2010. Our initial symposium addressed the culture and politics of the border region. Ballroom curated an exhibition of Mexican artists, many of whom looked at the border through the dual lens of identity and memory. We learned from this first undertaking that the inclusion of artists in the mix of authors, academics and other experts on the program helped broaden the public conversation and make the subject more accessible to a wider audience. Keep reading at www.washingtonspectator.org for more from Fish along with climate change insight from Diana Liverman from Institute of the Environment at the University of Arizona in Tuscon and Peter Lehner of NRDC. The study of climate change can be understood from one perspective as an anthropocentric reaction to changing volumes – of water, of petroleum, of particulate matter in the air – and as a confrontation of the false dialectic that is created when humans attempt to understand themselves as apart from nature. The concept of “preserving the Earth” is no longer relevant. Environmental action is largely driven by and predicated on the idea of finding ways for humans to continue to exist on this planet. Quiet Earth, an exhibition curated by Fairfax Dorn as part of Marfa Dialogues/New York, features environmentally-engaged works from the 1970s to the present. The exhibition takes its inspiration in part from the 1985 New Zealand post-apocalyptic film of the same name, and serves as an abstract documentation of the ways that humans have responded to the ecological crises of climate change with scientifically informed aesthetic practices. Quiet Earth is about an awareness of volume: That which we create, that which we consume, and that which may, in turn, consume us. Robert Rauschenberg’s Earth Day poster is a waypoint that announces the codification of this awareness, an artifact from the genesis of the modern day environmental movement and a recognition of the moment when these long-standing ecological concerns became a matter of mainstream consciousness. Ten years later when Rauschenberg was making Gluts, the assemblages composed of artifacts from the ‘80s-era oil boom in his home state of Texas, he described them as documentation of greed and excess, or “souvenirs without nostalgia.” Summer Knight Glut, a 1987 excerpt from this series, marks the effect of a surplus of a natural resource by recombining detritus from its manifestation as consumer product: It is made of gas stations. A concurrent perspective on volume is inherent in the ‘80s-era Donald Judd works, architectural plans which document rain catchment systems for desert dwellings, evidence of the ways in which the artist was confronting the scarcity of water in his adopted home in the Chihuahuan Desert of Far West Texas. From the same period, Hans Haacke’s Rhinewater Purification Plant demonstrates human impact on water systems, while Agnes Denes’ 2005 large-scale Pyramids of Conscience monumentalizes humanity’s relationship with Hudson River water, New York City tap water and crude oil, all of which are entombed for contemplation via the “pure technology” of the artist’s pyramids. Maya Lin’s Silver River – Hudson and Pin River – Sandy, 2013 track the waterway as well as the floodplain of Hurricane Sandy across Manhattan, giving materiality to the temporal shape of flood memory. Larry Bamburg’s BurlsHoovesandShells on an Acrylic Rake features a stack of burls taken from redwood, maple, oak and other species of trees that exist on a knife-edge: the gap between failure and success, as with life, is determined by the eternal battle between will and chance. Quiet Earth ends with the work of Trevor Paglen, an artist and geographer whose recent projects imagine the overflow of humanity beyond Earth, offering a sobering perspective on the place of our species on this planet, and in the universe at large. The Edible Geography blog talks with artists Miriam Simun and Miriam Songster about their GhostFood project. From a street-parked GhostFood truck, Simun and Songster and their team of trained staff will be serving a menu of three items, each of which conjures up a future dining experience for a food whose supply is currently threatened by climate change. The three items on offer — cod, chocolate, and peanut butter — come from or are species that “may very well soon not be available to eat,” Simun explains. With the help of a wearable smell-dispensing device and an edible textural analogue, GhostFood truck customers will experience a simulation of a future phantom food. “We’re going to serve the ‘ghost-cod’ deep fried,” explains Songster, “and we’ll use a vegan fish substitute made from extremely climate-change resilient ingredients.” Combined with a prosthetic device for delivering its lost flavour, the experience is designed to offer “a simulation of how you might experience that food once it’s no longer available,” adds Simun. Keep reading at Edible Geography, and check the Gallery Aferro page here for more information about GhostFood at Marfa Dialogues/NY. Six years ago, on September 14, I had walked along the Boulder Creek, following the blue discs in artist Mary Miss’ outdoor art installation “Connect the Dots: Mapping the Highwater Hazards and History of Boulder Creek.” Both Mary and I were participating artists (“29 women, 12 men, 10 collaborations”) in what was quite possibly the first comprehensive art exhibition on climate change: “Weather Report: Art and Climate Change.” The exhibition idea was conceived by Marda Kirn of EcoArts; was organized by renowned curator, writer and activist Lucy Lippard; and was presented by the Boulder Museum of Contemporary Art (BMoCA) in collaboration with EcoArts. It’s a week before her exhibition opening in the MFTA gallery, and Vadis is preparing her work for display. The studio walls are hung with large fabric paintings, tables covered with beads and sequins, and a floor full of ribbons from a season’s worth of non-stop creating. There are mannequins too, dressed in sumptuous skirts inspired by storms. In the warehouse’s studio space, Vadis looks back on the residency and her journey as an artist. On ‘shopping days’, members saw Vadis gliding through the 35,000 square-foot warehouse in one of the storm skirts, plucking inspiring discoveries from the shelves. She even found a stereo to play music mixes from favorite CDs while she worked. When she first arrived, the first body of work she created was with ribbon pieces sewed onto canvas. Then, Vadis began building her own canvases by weaving long strips of fabric and ribbons together. • Making the arts accessible to every member of the community. • Supporting and building recognition for artistic achievement. • Providing artists, organizations, and arts educators the technical, financial and social resources to encourage cultural production. Staten Island Arts recognizes artists and cultural producers as important community stakeholders. As the local arts council, we seek to empower them as such by supporting and presenting projects that work with ideas of cultures and communities in an integrated and accessible way and that help communities become more livable, sustainable, and/or socially engaged. • Public contemporary arts programs in “non-traditional” swing-spaces throughout the community and in our new program space, Culture Lounge, opening in December 2013. Staten Island Arts programs focus on topics that nurture and heal communities; educate and inform us about ourselves, our history, and our world; and build and improve community capacity or infrastructure; or inspire and mobilize individuals or groups. Over the past 20 years, Staten Island Arts has conducted public programming and technical assistance in all neighborhoods of Staten Island, serving a variety of underserved disciplines, ethnic communities, incomes, and ages. Staten Island Arts public programs feature performances, workshops, and installations by both emerging and established artists and curators. Programming specifically focuses on place-based projects, by both international and local artists from an array of disciplines, that examine aspects of the surrounding environment and communities, help people consider their environs in new ways, explore how their communities might be more livable and sustainable, and/or lead visitors to vehicles that allow them to become more socially engaged. Preparing for climate change is not just about prevention, but includes disaster preparation like New Earth MRE (Meal, Ready to Eat). Each of these packages is specially dehydrated by the artist, Tattfoo Tan, to make them shelf stable. If kept away from sunlight and moisture, MRE should last up to a year from the date prepared. You can rehydrate the food by adding boiling water and covering it with a lid for 20-30 minutes to expedite the process, then cooking until the desired texture is reached. For centuries, dehydrating food has been seen as a survival necessity. Many believe this preservation method is the safest, most affordable and best way to preserve flavors of foods. The dehydration process removes moisture from the food so that bacteria, yeast, and mold cannot grow. The added benefit is the dehydration process minimally affects the nutritional content of food. In fact, when using an in-home dehydration unit, 3%-5% of the nutritional content is lost compared to the canning method which losses 60%-80% of the nutritional content. Additionally, vitamins A and C, carbohydrates, fiber, potassium, magnesium, selenium and sodium are not altered or lost in the drying process. Therefore, the end result is nutrient packed food that can be stored long term. In the aftermath of Hurricane Sandy, here in New York City, food supplies were cut off. The local supermarket was flooded and food was destroyed and had to be thrown away. The National Guard was handing out food rations in some places, and the queue was long especially when time waiting in line could be better spent in clean-up and recovery. If everyone can take some effort to stock up their own emergency food ration, it will help in recovery efforts. Modern society is so used to acquiring its food from supermarkets, delis or restaurants. We have to have provision for times of emergency both for ourselves and our community at large. Hurricane Sandy is a wake-up call. When disaster happens, there will be no food, no petrol, and no car to buy any food anywhere. Why place ourselves in a position of helplessness? We should not despair, but be prepared. 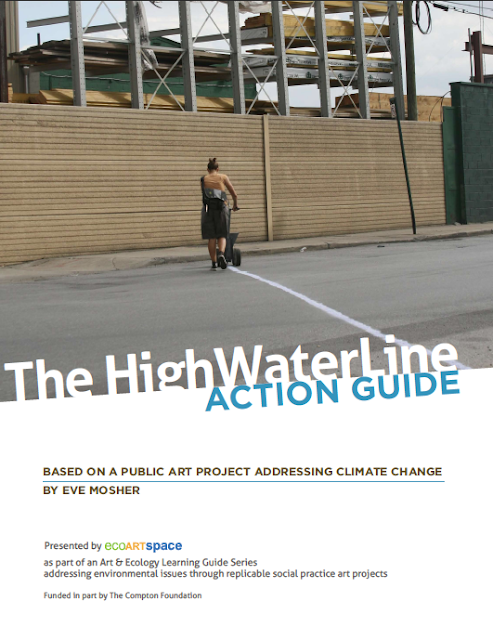 ecoartspace presents Eve Mosher’s HighWaterLine ACTION GUIDE, the first in a series of ten art and ecology learning guides presenting replicable social practice public art projects. In 2007, Mosher spent the summer marking the ten feet above sea level line throughout Lower Manhattan and Brooklyn to make visible for residents living along the coastline what scientists had been projecting as an increase in sea level in the next century. Little did she know when she conceived of this project that in 2012 Hurricane Sandy would pound the east coast with storm surges in some places beyond what anyone thought was possible. With this 36-page guide we are inviting educators, organizations and individuals to replicate what Mosher did in New York City anywhere in the world, to tell her story and to mark a line as appropriate for each individual locale. In the guide, other waterline marking materials and examples are provided, as well as Mosher’s step-by-step process involved in developing and performing the project. The Elqui River basin in Chile’s Coquimbo region is one of the driest places on Earth. It receives only about 100 millimeters (4 inches) of rain each year, and most of it during one short rainy season. The rainfall is also highly variable. In some years, the region will get close to zero rainfall, while in others it will get five times the normal amount. All of this presents quite a challenge to those managing the Elqui basin’s water resources, which provides drinking water for two cities and irrigation for large vineyards, small farmers and goat herders. The Elqui River is fed by snowmelt from the Andes and that collects in two large reservoirs, one of which is the Puclaro Reservoir. A widespread, multiyear drought that started in 2009 has depleted the Puclaro to only 10 percent of its capacity as of May 2013. Old villages that were abandoned and inundated after the Puclaro dam was built are now completely exposed and bone dry. Since 2010, the Earth Institute’s International Research Institute for Climate and Society along with UNESCO and their colleagues in Chile have been working with Elqui’s water authority to help them use seasonal forecasts as way to better allocate water and prepare for droughts. The water authority used these forecasts to generate water availability estimates for the first time in 2012. Now the goal is to better-integrate the climate information into policies that impact water management across the region. To learn more about the people of the Elqui basin and IRI’s work there, take a look at the photo essay above that I put together for World Day to Combat Desertification (#WDCD2013). Note: there’s an audio track of ambient sounds from Elqui that will play automatically. Read more about the work that IRI is doing with the Lamont-Doherty Earth Observatory as part of MD/NY — including their Climate Models calendar — on their profile page. New York, NY – The Robert Rauschenberg Foundation, Ballroom Marfa and the Public Concern Foundation today released the calendar of events for Marfa Dialogues/NY, a two-month series of events beginning this October that will combine art, activism and science to bring together disparate audiences for a broader and deeper examination of climate change. More than 30 of New York’s leading cultural and academic institutions are participating in Marfa Dialogues/NY, hosting a variety of events ranging from an installation on the High Line to a food truck that will provide an unconventional serving of foods vulnerable to climate change. The two-month calendar of events features a mix of environmental panels, live theatre, major art exhibitions, installations, community forums, musical performances and more – all accessible to the public and available via broadcast and digital media. A calendar of events is available at www.marfadialogues.org. Program descriptions and dates from Ballroom Marfa and the original 18 partners are available below. More programs will be scheduled over the next several weeks as additional partners finalize their events and new partners join the project. Additional partners currently include BAM, WNYC, American Institute of Architects New York, the Judd Foundation, Creative Time, the Buckminster Fuller Institute, Hester Street Collective, Waterwash, EcoArtSpace, Dia Art Foundation, and Cape Farewell. Marfa Dialogues was co-founded in 2010 by Fairfax Dorn of Ballroom Marfa, a leading contemporary arts center in Marfa, Texas, and Hamilton Fish of The Public Concern Foundation (PCF), a New York non-profit devoted to the advancement of public education around social and political topics. Marfa Dialogues was originally conceived as a symposium to broaden public exploration of the intersection of art, politics and culture. This year’s Marfa Dialogues/NY is made possible by a grant from the Robert Rauschenberg Foundation. For the most current calendar of events and additional information about partners and programs, visit www.marfadialogues.org. The Ballroom Marfa-curated visual art exhibition The Quiet Earth includes a major work by Robert Rauschenberg; architectural drawings of desert spaces by Donald Judd; works by Maya Lin, Amy Balkin and Hans Haacke and four large pyramid vessels by Agnes Denes in an exploration of human consciousness and our dialectical relationship with the planet. Hosting a panel discussion to explore the implications of a possible U.S. carbon tax on the attitudes, beliefs and practices of Americans with respect to energy use, consumption and the natural world. The panel will feature individuals who are well versed in environmental history and advocacy from a variety of scientific, artistic and political backgrounds. Presenting GhostFood, an installation and participatory performance by Miriam Simun and Miriam Songster that explores eating in a future of food scarcity and biodiversity loss caused by climate change. Traveling to several locations within the NY-NJ metro area, GhostFood will serve simulated taste experiences to the public out of a branded food truck. Simulations will center on the scents of foods threatened with extinction, employing a wearable headpiece to deliver the illusion of flavors that may soon be unavailable. Presenting Solar, an exhibition in video format featuring recent videos by acclaimed international artists who use their work to explore the spectacle of nature and the sense of cosmic stupor that captures humans when faced with the sublime vastness of our planet. Solar features works by Rosa Barba, Neil Beloufa, Camille Henrot and Basim Magdy. Presenting Water Water Everywhere/Nay Any Drop To Drink, a multimedia song cycle performance by Nora York, an exploration of climate change and the world’s water supply inspired by George Fredric Handel’s Water Music. Using her unique form of compositional adaptation and appropriation, York will riff on Handel’s work with projected images from visual artists whose works engage water and the environment as a metaphoric landscape. Starting at Bowling Green – ending at 23rd St.
CaLL/WALKS, a program of BROADWAY: 1000 Steps, is a series of walks and panel discussions taking place along the length of Broadway between Bowling Green and 240th Street. The fall 2013 WALKS will afford artists an opportunity for preparatory dialogues with scientists and community representatives to bolster their vision, insights and creative thinking with technical and contextual information and feedback. Shifting Domains, a panel moderated by Suzaan Boettger, will examine the CaLL Framework as well as other artist strategies that are recasting the role of the artist as affective catalysts for social change. In partnership with the NYC Center for Materials Reuse, MFTA is hosting “Waste Characterizations,” an analysis of the composition of donated items and volume of disposed waste. Findings from this study will result in an artists’ exhibit highlighting MFTA’s environmental impact and the value of reuse in NYC’s policies for climate change. To accompany the exhibit, a free public art workshop will be held to introduce the science of waste characterization and the concept of reuse to the NYC audience. Two of the leading voices on the issue of climate change—artist and honorary NRDC Trustee Maya Lin and NRDC President Frances Beinecke—will discuss the critical role artists, advocates and scientists play in addressing climate change, the role of art in mobilizing and educating the public, and the great potential for environmentally focused artwork to affect climate change policy. The discussion will use two of Maya Lin’s most recent projects, What is Missing? and Greenprint For the Future, as examples of collaborations to engage the public about climate change. In collaboration with Pratt Programs for Sustainable Planning and Development’s RAMP Initiative, the Center for Social Inclusion will present “Our Climate, Our City, Our Future: Hurricane Sandy One Year Later,” a series of workshops at museums throughout New York City on recovery, adaptation, mitigation and planning with communities post-Hurricane Sandy. The workshops will include presentations from architects, artists and community activists on neighborhood development and re-development in communities most vulnerable to the effects of climate change. Presenting the first U.S. solo exhibition of Danish artist Tue Greenfort, whose interdisciplinary practice deals with issues such as the public and private realm, nature and culture. A series of public programs, including panels with experts, artist conversations, and community workshops will focus on the history of environmentalism in relation to art and ecology in the United States and New York City in particular. Greenfort’s exhibition and the discussions hosted around it will seek to uncover parallels between art and ecology, presenting notions of nature, wilderness and natural resources. Introducing a series of green roofs atop shipping containers that have been an architectural staple within the park for over two decades. In collaboration with a team of horticulturalists at Plant Specialists, NY-based artist David Brooks will “green” three containers into works of art that explore New York City’s strategy to reduce its carbon footprint through green roofs. Also on view in the park will be tree wood by Toshihiro Oki architect pc, a Broadway Billboard by Wangechi Mutu, and the 2013 Emerging Artist Fellowship Exhibition, featuring 15 new commissions by emerging artists. Presenting two roundtable discussions as part of Speculations, the organization’s ongoing investigation of the future and the demands it makes on the present day. The roundtables will consider climate-change adaptation and mitigation from scientific and artistic perspectives and survey a range of viewpoints on ecology and nature. In addition to the roundtables, Triple Canopy will publish a book in which artists, writers, technologists, economists, activists, and ecologists have been challenged to propose visions of the future in creative forms. Presenting Climate Past, Present and Future, an installation and panel discussion. Along with photographs for the 2014 Climate Models calendar, which brings scientists and their research into the public view, a panel of four climate scientists will discuss ways to make study of our climate and adaptation to it more accessible and understandable. PositiveFeedback, an initiative led by The Earth Institute of Columbia University, will host two events bringing artists and scientists together. The first is an original play, Don’t be Sad, Flying Ace!, performed by Superhero Clubhouse, a sustainable collective of artists and advocates working at the intersection of environmentalism and theater. This educational play is inspired by Charles Shultz’ iconic beagle and features a dog that perches on his doghouse as waters rise around him. It incorporates leading climate science on topics like sea level rise. The second event will be the latest edition of PositiveFeedback’s “Art/Science Speed-Dating,” an event designed to bring artists and climate scientists together to determine if there are “sparks” for future interdisciplinary collaboration. Hosting Emissions/Admissions, a panel discussion bringing together artists and greenhouse gas experts to discuss the study The Preliminary and Extended Reports on Ground-Level Ambient Methane Levels in Manhattan, which examines the impacts of greenhouse gases. An exhibition of works examining these impacts will accompany the panel discussion. Opening Reception: Oct. 11, 7PM-9PM; Ongoing Exhibition. “Climate, Data, Art: Seeing Measurements in New Ways” is an exhibition showcasing the work of data artists on the subject of climate change. Data-driven art is part of a growing movement of artists focusing on the graphic side of data analysis. The pieces included will illustrate climate change data in creative and informative ways, blending media and art genres, communicating issues we cannot grasp through statistics and data tables alone. The exhibition will be curated by Isabel Draves, Founder of LISA (Leaders in Software and Art). Hosting Food & Climate Change: Growing a Cultural Movement, a forum examining how locally designed and developed sustainable food-oriented solutions can help communities respond to the challenges of climate change. The forum will feature a diverse range of leaders and innovators who have engaged in explorations of climate change and the tools needed to create a culture of sustainability. Exploring the universal yet differentiated qualities of the natural, global phenomenon of weather – especially the connection between contaminated air and our efforts to condition, or control, the air. MODU’s Weather (Un)Control will present/create an installation that relates the control of weather with its contamination in both outdoor and indoor environments. In partnership with Columbia University Earth Institute/PositiveFeedback, Superhero Clubhouse will present a double bill: Don’t Be Sad, Flying Ace! and Field Trip (A Climate Cabaret). Superhero Clubhouse is a sustainable collective of artists and activists working at the intersection of environmentalism and theater. Field Trip is a mash-up of camp and crusade, featuring original songs, dance, storytelling and poetry. Inspired by Charles Shultz’s iconic beagle and incorporating leading climate science, Don’t Be Sad, Flying Ace! is a delightful tour-de-force about resilience and adaptation. A trailer for the 1985 film that inspired the Ballroom Marfa-curated exhibition of the same name. More on the exhibition here. Quiet Earth opens at the Rauschenberg Project space on October 15, 2013. In June 2013 the Robert Rauschenberg Foundation invited me (with @JoesPub at The Public) to present a concert as part of the Marfa Dialogues/NY on Climate Change. #MDNY Their invitation provided me an opportunity to start exploring the vast subject of water; I chose Handel’s Water Music Suite as my foundation. Here is the first song completed. I shot the video this summer on Martha’s Vineyard — check www.norayork.com for concert details. hint- it’s free! Last year Hurricane Sandy hit where I live and work — New York City — devastating the whole North East. I was struck by what was right before my eyes. Water was everywhere, there were cars floating down the streets of lower Manhattan. Water brought the largest city in the USA to its knees. When the Robert Rauschenberg Foundation invited me (with Joes Pub at The Public) to present a concert as part of the fall Marfa Dialogues/NY event I was decided it was an opportunity for me to explore the vast subject of water. I have a web radio show at ArtonAir.org called Love Crazy. What a great opportunity to begin thinking about the subject of water by creating a new radio show – on and about water. Stay tuned for more Love Crazy radio shows this fall where I will invite some of the project partners from the Marfa Dialogues/NY to tell us about there artistic practice. Founded in 1972 by Alanna Heiss, the Clocktower Gallery is a legendary alternative art space for exhibitions, performances, long-term and site-specific installations, and artist residencies. Over its 40-year history, the Clocktower has presented formative work by some of the most important artists of our time, including Gordon Matta-Clark, Max Neuhaus, Lynda Benglis, Dennis Oppenheim, Vito Acconci, Nam June Paik, Charlotte Moorman, Laurie Anderson, David Tudor, Marina Abramović, and Christian Marclay, among many others. Today, the Clocktower presents a full program of exhibitions, performances, and residencies that honor the spirit of the alternative spaces movement by focusing on experimental, interdisciplinary, and intergenerational projects. The Clocktower Gallery’s radio station is a free and searchable online cultural audio archive operating at www.ARTonAIR.org. Its 5,000 hours of diverse, indexed content –an unduplicated collection in any media– consist of non-commercial music, audio art, spoken word, cultural news, history and dialogue, and new media innovation. ARTonAIR’s mission is to excel as a globally accessible and technically innovative deliverer of content, through a traditional radio-style stream of hosted shows in a curated schedule and a searchable on-demand archive. Together, the Clocktower Gallery and ARTonAIR.org function as a laboratory for experimentation, working closely and collaboratively with artists, musicians, curators, writers and producers to develop, realize and present innovative and challenging work in all media, ranging from installation to performance and from experimental music to radio theater. By engaging both the physical resources of its historical gallery space and ARTonAIR’s access to a broad and international online radio audience, the Clocktower is able to disseminate experimental work to numerous communities, and promote a rich cultural and social dialogue between artists, audiences, and institutions worldwide. To the many friends and supporters of the Marfa Dialogues in the high desert – We have exciting news: the Marfa Dialogues project is hitting the road and will be opening this fall in New York City with a series of programs on climate change and the arts that will expand on the symposium held in Marfa last September. It’s been our dream to build on the work we started here in 2010, and to export the Marfa Dialogues model of engaging the arts with social and political concerns to communities around the country. With the support of our partners at the Robert Rauschenberg Foundation we have created a two-month long Marfa Dialogues calendar of events in New York, beginning in October. More than 20 leading New York cultural, academic and public interest institutions are participating in this city-wide public conversation around climate change. Like our Marfa project, but on a larger scale, the Marfa Dialogues/New York program will feature community forums, public panels, an exhibition curated by Ballroom Marfa at the Rauschenberg project space in Chelsea, an online magazine, public sculpture projects, theater performances, cabarets and film exhibitions – and in the enduring spirit of Marfa, we also have an environmentally conscious food truck as one of our program partners. Through your participation as co-sponsors, audience members and supporters, the Marfa community has helped shape this initiative. We are hugely grateful for the collaborative efforts of Tim Johnson and Caitlin Murray of the Marfa Book Company; Robert and Rosario Halpern of the Big Bend Sentinel; Tom Michael and the staff at Marfa Public Radio; Farm Stand Marfa; Cochineal; Maiya’s; Rob Crowley, Gory Smelley; The Crowley Theater; Thunderbird Hotel and The Capri; Padre’s; Robert Potts of The Dixon Water Foundation; and to the Food Shark and chef Rocky Barnett for all of their amazing creations. Add to that all of the camera people, copywriters, graphic artists, publicists and the very long list of all of you who contributed so much to the success of our first two Dialogues. Even as we are expanding the horizons of the Marfa Dialogues project, we will continue our established practice of producing a new Marfa Dialogues program every other year here in Marfa. So break out the new dress and press that shirt – the Marfa Dialogues will be returning to Marfa in the fall of 2014. And with the Marfa Dialogues banner flying over New York this fall, we hope if you can you’ll join us there and be a part of the exciting schedule of climate change programs being organized across the city. In the next several weeks we’ll be posting more details about the calendar of events on ballroommarfa.org and our new website, marfadialogues.org. For more information on Marfa Dialogues past and future, visit the archive. August 20, 2013, New York City – The Buckminster Fuller Institute (BFI) is proud to announce the Semi-Finalists for the 2013 Buckminster Fuller Challenge. “We received a record number of entries this year, making it more difficult than any year from the past six years, to narrow down the pool to these 19 extraordinary initiatives”, said Elizabeth Thompson, BFI’s Executive Director, “once again our distinguished jury will have a very tough job selecting the top entries”. The jury will engage in the final phase of the vetting process over the next six weeks and will convene in person for the final deliberation in New York City on October 7th, 2013. Join us in New York City for a public discussion with the jurors as part of the city-wide Marfa/NY Climate Change events at the School of Visual Arts on the evening of October 7th. Stay tuned for program details. These nineteen proposals currently under consideration have undergone a rigorous review for adherence to the entry criteria. Each project has been through up to four rounds of vetting by the members of the Challenge review team, undergoing extensive analysis and discussion. An in-depth interview was then conducted with the individuals or teams behind the top contender strategies in order to delve deeper into the more technical aspects of their projects, as well as to understand the underlying principles informing their work. “It is a significant achievement to advance to this stage of the selection process, especially this year, with our growing number of partner organizations offering additional enhancements to semi-finalists”, explained Sharifah Taqi, The Buckminster Fuller Challenge program manager. BFI invites you to take a deeper look into each of the projects below. They represent an exemplary body of work — including whole systems solutions as well as targeted efforts toward a gap within a system — each addressing a pressing global issue around sanitation, materials, water, energy, disaster prevention, poverty, food and ecology. They are all truly inspiring, and while only one project will receive the cash prize, they all deserve and need our support, so we are especially excited that our sponsor, Interface Inc., is committed to providing an immersion opportunity for a finalist or group of finalists this year. Stay tuned for more by joining our mailing list here! The Loowatt System, a self-contained human waste collection and processing system that, rather than being faced with the typical costs of centralized sewage treatment systems, creatively converts human waste into energy and fertilizer, improving local health conditions, while providing economic opportunity. SOIL, a non-profit based in Haiti, provides locally-built dry toilets complete with a system for collecting, hauling and composting solid human waste and turning it into valuable fertilizer, reducing risks to human health from exposure to raw sewage while generating local employment and improving agricultural productivity by enhancing the soil fertility of degraded farmland. Mushroom Packaging is a new class of home-compostable bio-plastics made from living organisms, mushroom mycelia, developed by Ecovative. Their high-performance, environmentally responsible alternatives to traditional plastic foam packaging, insulation, and other synthetic materials offer a revolutionary, truly sustainable alternative to the current toxic plastic foam materials that pollute and burden the modern world. Public Laboratory for Open Technology and Science collaboratively develops inexpensive, open-source monitoring tools and techniques in order to ‘democratize’ science and empower a grassroots network of ‘citizen scientists’ to be able to accurately measure environmental problems, and, when necessary, challenge inaccurate government and industry environmental health data in order to demand accountability. Bioenergy Value Chain, or Abellon Clean Energy, is a comprehensive clean-energy system: they buy excess agricultural waste from local farmers (typically either burned, causing air pollution and respiratory illness, or ineffectively composted, releasing methane), and turn that plant material into efficient and clean-burning â€˜pelletsâ€™ that can then power industrial plants, businesses and small homes. . Healthy Watersheds for Clean Energy symbiotically addresses poverty and deforestation by mobilizing communities in remote northern Nicaragua to monitor and police their forests and to practice ecologically-sound agriculture by working with them to install non-polluting, low-impact micro-hydro electrical generation facilities, showing them that the electricity and clean water is dependent on the vitality of the forests in their watershed. TBS River Regeneration works to restore river systems and local rural economies in India by drawing from ancient water wisdom, empowering local communities to build small traditional rainwater harvesting structures (johads) as well as by developing local and national awareness and education programs. The Green Chemistry Commitment, an initiative to get university chemistry departments to commit to integrating Green Chemistry into their academic curricula and transform how chemistry is taught and practiced in order to eliminate the numerous devastating neurotoxic and carcinogenic chemicals that characterize modern life and damage the global ecosystem, replacing them with non-toxic alternatives. IBJ Legal Training Resource Center works to prevent falls in the gap of worldwide legal systems, rather than exposing wrongdoings after the fact, they are training attorneys and legal officials in legal best practices and creating a global legal community that can be supportive and protective of lawyers working in difficult contexts. Voltree Acoustic Early Detection Sensor System harvests power from a living tree to convert its chemical activity into small amounts of electric current and to ‘read’ its levels of dehydration, disease, fire risk, even potential seismic activity and CO2 levels, anticipating emerging challenges in agriculture and forestry in order to prevent such things as insect infestations and fire. 100,000 Homes Campaign, an ambitious campaign to spark a “national movement to house America’s most vulnerable homeless people” by reframing the issue as a health crisis and transcending entrenched mindsets to figure out how to effectively collaborate and how best to allocate existing financial resources. Fundacion Paraguaya aims to eliminate poverty in Paraguay using a bottom up strategy that combines granular analysis and data collection, grassroots financing, precise targeting of services, and coordination on a national anti-poverty effort. Echale a tu Casa, an elegantly integrated model that combines community empowerment, local technical capacity building, a novel, affordable financing system, and cutting-edge but culturally appropriate “green” building techniques to improve housing conditions for otherwise underserved populations in Mexico. MASS Design Lab is a research project of MASS Design Group, exploring the integration of public health, economic development, environmental performance and education into a comprehensive formalized architectural strategy through a rigorous assessment process and immersive community component. Build Change aims to radically reduce the number of people who die or are injured in natural disasters, especially earthquakes, by widely disseminating best-practice building and retrofitting methods in the most seismically at-risk regions of the planet. PITCHAfrica: Waterbank Schools, a building prototype in Laikipia, Kenya, is a working demonstration of the remarkable leveraging power of water catchment as a socially integrated resource awareness and community engagement tool. .
Ento is introducing insects to the Western diet. As agricultural productivity cannot keep up with global food demands, edible insects potentially have positive environmental benefits globally as well as on human health. Olazul, a non-profit organization working to improve coastal community livelihoods in developing countries, is developing a more sustainable model of shrimp farming, and contributing to the restoration of ocean ecosystems as well as increasing support for marine conservation. .
Cooperafloresta, using both rediscovered traditional ecological knowledge and modern agricultural science, Cooperafloresta is accelerating the natural succession of flora and fauna in agriculturally degraded areas of Brazil, going further than ‘organic agriculture’ and Biodynamics by using agroforestry techniques to bring major environmental and socio-economic benefits to poor rural communities. To view all the 2013 Challenge entries that opted to publish their work, visit the Idea Index, a web based publishing system created to enhance the opportunity for proposals to receive support. To receive updates on the Buckminster Fuller Challenge email challenge@bfi.org. The Buckminster Fuller Institute is dedicated to accelerating the development and deployment of solutions which radically advance human well being and the health of our planet’s ecosystems. We aim to deeply influence the ascendance of a new generation of design-science pioneers who are leading the creation of an abundant and restorative world economy that benefits all humanity.Our programs combine unique insight into global trends and local needs with a comprehensive approach to design. We encourage participants to conceive and apply transformative strategies based on a crucial synthesis of whole systems thinking, Nature’s fundamental principles, and an ethically driven worldview.By facilitating convergence across the disciplines of art, science, design and technology, our work extends the profoundly relevant legacy of R. Buckminster Fuller. In this way, we strive to catalyze the collective intelligence required to fully address the unprecedented challenges before us. To join BFI’s monthly newsletter Trimtab, sign up here. The Center for New York City Affairs seeks to improve the effectiveness of government and other organizations in their work with low-income urban communities in New York City. The Center works where people’s lives intersect with government and community organizations to illuminate the impact of public policy on the lives of ordinary people. We are committed to constant collaboration with government and non-profit organizations, residents, advocates, researchers and journalists. The Center is widely recognized for its role as a non-partisan broker of information and analysis. The Center for New York City Affairs at The New School has a long, successful history of hosting engaging and timely public forums that include members of the community and spark meaningful discussion among practitioners, policymakers, intellectuals, and the public. Public events at the Center boost a diverse and robust audience, including community and cultural leaders, government officials, nonprofit and academic administrators, students and their parents, community members and members of the press. Food has powerful cultural meaning, and has increasingly become part of the growing ideological and political discussions around the planet’s changing climate. Food can help communities develop, sustain, and increase their viability while helping mitigate negative impacts of climate change. This cross-disciplinary brainstorming and dialogue will examine how sustainable, locally designed and developed solutions can help communities respond to the challenges of climate change. The discussion will focus on design and cultural interventions that reconnect people to food production while transforming the environment. This forum aims to spur discussion and action among farmers, urban community leaders and innovators, designers, artists, policymakers, scholars and others who are engaged in developing effective and imaginative responses to climate change. Marfa Dialogues/NY is an examination of climate change science, environmental activism and artistic practice taking place this October and November 2013 in New York City. A collaboration between the Robert Rauschenberg Foundation, Ballroom Marfa and the Public Concern Foundation, Marfa Dialogues/NY will feature more than 20 Program Partners, including the Center for New York City Affairs, and a spectrum of exhibitions, performance, and interdisciplinary discussions at the intersection of the arts and climate change. Michael Pollan’s new book, Cooked: A Natural History of Transformation, is now available for purchase, and the self-described “nature writer who writes about this particular part of nature that we don’t think of as nature” is popping up all over the place, from The Colbert Report to the Field Lab. In September of 2012 Pollan joined us here in Far West Texas for the second Marfa Dialogues symposium. He and Hamilton Fish had a sprawling conversation in front of a packed house at the Crowley Theater, the entirety of which is available for your viewing pleasure up above.